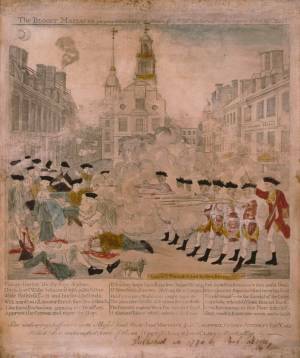 A sensationalized portrayal of the skirmish, later to become known as the "Boston Massacre," between British soldiers and citizens of Boston on March 5, 1770. On the right a group of seven uniformed soldiers, on the signal of an officer, fire into a crowd of civilians at left. Three of the latter lie bleeding on the ground. Two other casualties have been lifted by the crowd. In the foreground is a dog; in the background are a row of houses, the First Church, and the Town House. Behind the British troops is another row of buildings including the Royal Custom House, which bears the sign (perhaps a sardonic comment) "Butcher's Hall." Beneath the print are 18 lines of verse, which begin: "Unhappy Boston! see thy Sons deplore, Thy hallowed Walks besmeared with guiltless Gore." Also listed are the "unhappy Sufferers" Saml Gray, Saml Maverick, James Caldwell, Crispus Attucks, and Patrick Carr (killed) and it is noted that there were "Six wounded; two of them (Christr Monk & John Clark) Mortally."